How is digital processing used in live sound? DSP (short for “Digital Signal Processing”) is used widely in live sound to process audio after it has been converted to digital information. Some of the advantages of digital processing, as opposed to analog processing, are reduced noise and distortion, as well as increased dynamic range. DSP can be used to perform a huge variety of audio functions such as equalization, compression, limiting, reverb, delay, and more. This month we’ll see how DSP is used in powered loudspeakers and their built-in amplifiers; next month, we’ll talk about how it’s used in mixers. D-CONTOUR (Dynamic Contour) is a multi-band dynamic processor that monitors the output of multiple frequency bands, and sends data back into an intelligent sensing system. This system automatically tunes the EQ for each frequency band so that the speaker can produce maximum Sound Pressure Level (SPL) while also maintaining clear and powerful sound regardless of volume level. One of the advantages of the DBR Series is that their enclosure shape allows them to be used either as main PA speakers or as floor monitors. The D-CONTOUR switch modifies the speaker’s internal digital EQ for each specific application. When a DBR is used as a main speaker, it will usually be mounted on a stand such as the Yamaha SS238C or atop a Yamaha DXS Series subwoofer. Loudspeakers typically lose low-frequency response when suspended or mounted on a pole. The FOH/MAIN position of the D-CONTOUR switch boosts the low frequencies to correct this problem. Placing any speaker near a boundary such as a wall or floor increases the low frequencies, often making the sound boomy and reducing clarity. 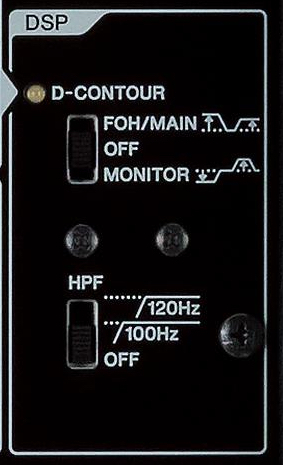 Setting the D-CONTOUR switch to MONITOR reduces the DBR’s low-frequency range and restores that clarity when it is placed on the floor as a stage monitor. You also have the option to turn off D-CONTOUR if you feel that a flat response will work better in a particular situation. The second DSP switch on the DBR is labeled HPF, short for high-pass filter. You may recall from our Tools of the Trade posting about Equalization that this kind of filter cuts low frequencies only, allowing the high frequencies to pass untouched (hence its name). If you’re using a DBR without a subwoofer, set this switch to OFF to extend the low frequency range. When you’re ready to play larger rooms, you can add a subwoofer such as a Yamaha DXS Series to enhance the low end capabilities of your PA system. In that case, set the DBR’s HPF to either 100 Hz or 120 Hz — whichever works best with your particular subwoofer (you can find that information in its owners manual.) As a bonus, using the HPF will also enhance the clarity of the DBR above the selected frequency. 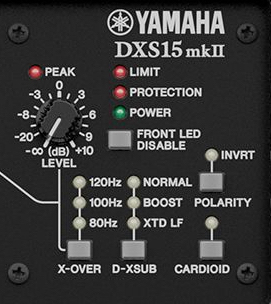 Yamaha DXS Series subwoofers offer several rear-panel switches that are used to control internal DSP. One of these switches is for the crossover (“X-OVER”) frequency and it can be set to 80 Hz, 100 Hz or 120 Hz. In our recent Tools of the Trade posting “Deciphering Power Ratings, Part 2,” we explained that a crossover is a series of filters that direct certain frequencies to certain speakers (sending the low frequencies to a woofer, and high frequencies to a tweeter, for example).When using a DXS subwoofer and DBR speaker together, set the DBR’s HPF and the DXS’s X-OVER switches to the same frequency. This will ensure that the speakers don’t overlap and produce an unnatural low-frequency response. The other switch on DXS subwoofers is the D-XSUB switch for EQ presets. The BOOST setting provides a tight, focused bass with a slight boost between 60 and 70 Hz. The XTD LF (short for “extended low frequency”) setting allows the DXS to reach down to lower frequencies, enabling it to produce powerful low end that other compact subwoofers can’t achieve. When the BOOST or XTD LF settings are used, the D-XSUB function controls the boost dynamically in relation to the volume level so that you’ll get powerful bass even at lower volume levels. The OFF position provides a flat frequency response without any D-XSUB enhancement. DXS15 mk II subwoofer controls. One big advantage of powered loudspeakers is that their built-in amplifiers and crossovers can be perfectly matched to the transducers. DXS Series loudspeakers have an internal digital crossover that employs exclusive Yamaha FIR-X™ (Finite Impulse Response) filters to optimize frequency and phase response, resulting in better clarity and imaging than is possible using traditional analog crossovers. What’s more, each speaker and amplifier is measured and tested at the Yamaha factory, and DSP is then used to calculate the maximum safe output level for each component. The status of the power supply, amplifiers, and transducers are also constantly monitored by a microprocessor and DSP for excessive heat, shorts or other potentially damaging conditions, allowing the speakers to operate at their highest capability while maintaining safe, reliable operation — even in the most strenuous of conditions. Tune in next month when we’ll see how DSP is used in mixers. 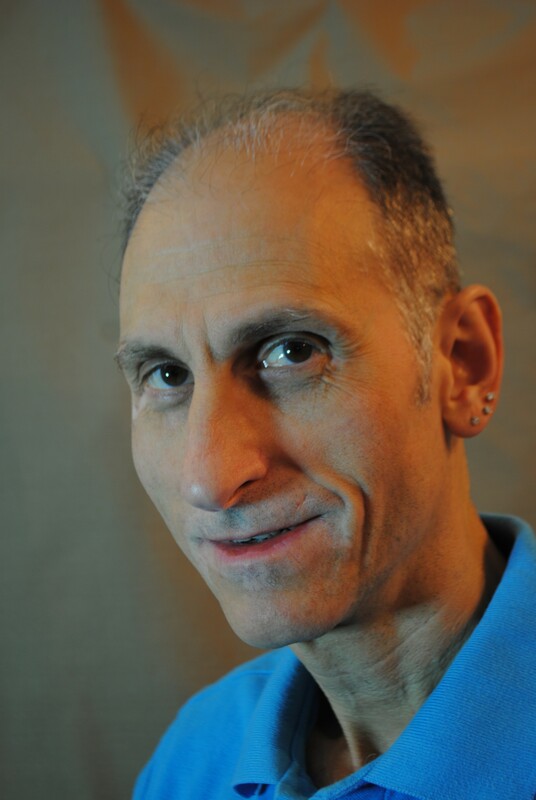 Steve La Cerra is an independent live sound and recording engineer based in the New York area. He is the front-of-house engineer and tour manager for Blue Öyster Cult and has worked with artists such as Joe Jackson, The Struts, Firehouse and Robert Fripp. Steve teaches Music Technology at Mercy College in Dobbs Ferry, NY and has authored many articles on professional audio technology. He is currently working on a book about live sound.